Authors: Potemkin V.V., Goltsman E.V., Kovaleva M.S. Thyroid associated orbitopathy (TAO) occurs in patients with various diseases of the thyroid gland. The levels of episcleral venous pressure (EVP), intraocular pressure and intraorbital pressure are inter- related. There are no precise data on the change of EVP in patients with TAO. Purpose. To evaluate EVP in patients with compensated and sub-compensated TAO forms. Methods. Data of 41 eyes of 22 patients were enrolled into the study. The main index to be evaluated was the EVP. Results. EVP level was significantly higher in complete venous compression in the lower- temporal quadrant in patients with sub-compensated TAO stage (p = 0.013). Conclusion. The degree of venous outflow obstruction and the EVP level of are interrelated. Thus, the level of EVP can be used as an additional factor in assessing the severity of the disease course and the treatment efficacy. thyroid associated orbitopathy, episcleral venous pressure. Endocrine ophthalmopathy (EOP) is an autoimmune inflammatory disease affecting the orbital soft tissue and ocular adnexa. Its main clinical manifestations include enlargement of the extraocular muscles, increased orbital fat volume, and orbital soft tissue edema . EOP usually develops in patients with thyroid disease. The prevalence of autoimmune thyroid disorders with thyroid hypofunction in adults varies between 0.5% and 2% in different regions, and 40%–60% of these patients develop ophthalmopathy [2–4]. In 90% of patients, such ophthalmopathy is associated with toxic goiter (Graves’ disease), whereas in 6% EOP occurs in euthyroidism conditions [8–11]. Less than 3% of patients with EOP have Hashimoto’s thyroiditis or secondary hypothyroidism [12–15]. Currently, no unified classification system for EOP exists. In our practice, we use the classification developed by Brovkina, which describes three variants of EOP, including thyrotoxic exophthalmos, edematous exophthalmos, and endocrine myopathy. These variants are characterized by different clinical manifestations, patient complaints, and pathologic changes; however; they can convert into each other [1, 16]. Several classification systems exist to assess EOP severity, including the No physical signs or symptoms, only signs, soft tissue involvement, proptosis, extraocular muscle signs, corneal involvement, and sight loss classification (1969, 1977), Clinical activity score classification (1989), vision, endocrine, strabismus, and appearance classification (2006), and the European group on Graves’ orbitopathy recommended classification (1999) . In this study, we used the scoring table developed by Brovkina for estimating EOP severity . EOP can cause many ophthalmic disorders, such as proptosis, diplopia, orbital tissue and ocular adnexa (eyelids and ocular surface) lesions, and optic neuropathy. Increased intraocular pressure (IOP) is one of the least studied EOP manifestations. Increased IOP in a patient with EOP was first described in 1987 in the Guy’s Hospital Reports of London . The prevalence of ocular hypertension among patients with EOP varies between 5% and 24% [18–20]. Aleskerova et al. reported a 51.6% prevalence of ocular hypertension in patients with sub- and decompensated edematous exophthalmos . Increased IOP on upgaze is observed in approximately 25%–75% of patients with EOP [18, 20]. Several hypotheses describe increased IOP in such patients, including those attributing increased IOP to elevated episcleral venous pressure (EVP) caused by an increase in the orbital soft tissue volume and impaired venous outflow [21, 22], compression of the venous reservoirs (primarily of the superior ophthalmic vein) by the enlarged and fibrotic extraocular muscles , increased resistance to intraocular fluid outflow through the trabecula , genetic predisposition to glaucoma , and accumulation of mucopolysaccharides in the trabecula [23,24,26]. It is certain that EVP and IOP are closely associated with each other. It is well known that a 0.8-mmHg increase in EVP causes a 1-mmHg increase in IOP . No information on EVP changes is currently available for patients with EOP. Moreover, none of the aforementioned classifications consider EVP, although it is a potential marker reflecting EOP severity. Therefore, this study aimed to evaluate EVP in patients with compensated and subcompensated EOP. We examined 22 patients (41 eyes) with EOP between October 2017 and March 2018. These patients were divided into two groups: 14 patients (27 eyes) with compensated (Group 1) and eight patients (14 eyes) with subcompensated (Group 2) edematous exophthalmos. In addition to a standard ophthalmologic examination, all patients underwent measurements of palpebral fissure height, exophthalmos (with a Hertel exophthalmometer), and EVP in the lower nasal and lower temporal quadrants. EVP was evaluated by a noninvasive method using an episcleral venomanometer EV320 (Eyetech, Morton Grove, IL, USA) fixed on a slit lamp (Fig. 1a). EVP was measured at the beginning of the examination, when the tested vein was partially compressed, and later when the vein was completely compressed (Fig. 1b). In our study, we used a scoring table developed by Brovkina to evaluate EOP (Table 1). This table contains 14 classes, each reflecting subjective and objective conditions of a patient. This classification system allows scoring within each class (score 0–4) [1, 27]. EOP severity was estimated by summarizing all scores. Scores 0–6 corresponded to compensated, scores 12–15 to subcompensated, and scores 23–29 to decompensated EOP [1, 3]. Statistical analysis was performed using the SPSS Statistics v20.0 software (SPSS, Inc., Chicago, IL, USA). We calculated mean values and standard deviations. Student’s t-test was used to compare quantitative variables between the two independent groups. The Kolmogorov-Smirnov test was used to check the normality of data. Differences were considered significant at p < 0.05. Patients with subcompensated EOP demonstrated significantly higher EVP with complete compression of the episcleral veins in the lower temporal quadrant (р = 0.013). In the case of partial episcleral vein compression in the lower temporal and lower nasal quadrants, and complete compression in the lower nasal quadrant, EVP was slightly higher in patients with subcompensated EOP; however, the differences were not statistically significant (p > 0.05; Table 2). IOP, palpebral fissure height, and exophthalmos grade were significantly greater in Group 2 patients (Table 3). Note: EOP, endocrine ophthalmopathy; EVP, episcleral venous pressure. Corneal and optic nerve lesions are the main causes of impaired visual functions in patients with EOP. Optic neuropathy, often affecting EOP patients and being one of the most common causes of vision loss, is associated not only with direct compression but also with impaired venous outflow. EVP can be used as a surrogate marker for impaired venous outflow. Our findings confirmed this statement and indicated higher EVP in the lower temporal quadrant in patients with subcompensated EOP. Unfortunately, the described technique of EVP measurement is subjective. For example, vessel sizes selected for compression may vary, thereby affecting the examination results. Vessel size is a probable reason for the difference in pressure observed between the lower nasal and lower temporal quadrants. So far, there are no clear recommendations on the quadrants and exact vessels for EVP measurement. Thus, EVP measurements in patients with EOP can be used to evaluate disease severity and serve as a criterion for assessing treatment efficacy. EVP measured in the lower temporal quadrant with complete compression of the episcleral vein is the most indicative characteristic in patients with EOP. The authors declare no conflicts of interest related to the current manuscript. Authors’ contribution: V.V. Potemkin developed the research concept and study design. V.V. Potemkin, E.V. Goltsman, and M.S. Kovaleva performed data collection and processing. V.V. Potemkin, E.V. Goltsman, and M.S. Kovaleva performed data analysis and drafted the manuscript. Henzen C. Hyperthyroidism - differential diagnosis and differential therapy. Praxis (Bern 1994). 2003;92(1-2):18-24. doi: 10.1024/0369-8394.92.1.18. Marocci C, Bartalena L, Pinchera A. Recent progress in Graves’ ophthalmopathy. Curr Opin Endiocrinol Metab. 1996;(3);417-422. Shaarawy TM, Sherwood MB, Hitchings RA. Glaucoma. Medical diagnosis and therapy. New York: Elsevier; 2015. Lissak B, Tazartes M, Heron E, Feldman S. Orbitopathies thyroïdiennes en milieu ophtalmologique. Presse Med. 2002;31(2):64-68. Scott IU, Siatkowski RM. Thyroid Eye Disease. Semin Ophthalmol. 2009;14(2):52-61. doi: 10.3109/08820539909056064. Van Ruyven RL, Van Den Bosch WA, Mulder PG, et al. 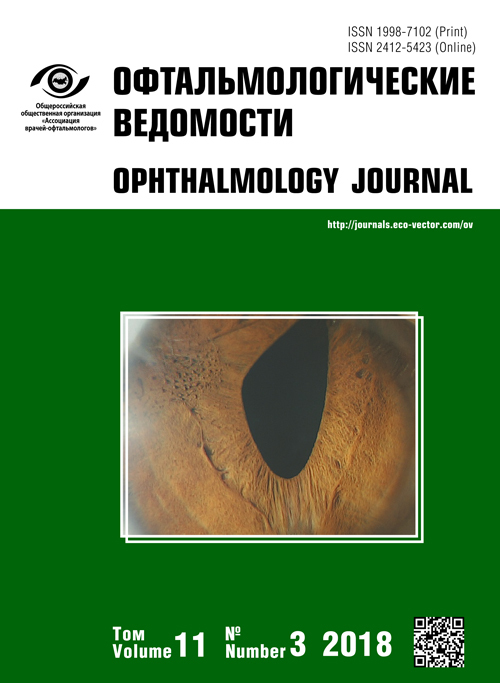 The effect of retrobulbar irradiation on exophthalmos, ductions and soft tissue signs in Graves’ ophthalmopathy: a retrospective analysis of 90 cases. Eye (Lond). 2000;14 Pt 5:761-764. doi: 10.1038/eye.2000.199. Bartley GB. The epidemiologic characteristics and clinical course of ophthalmopathy associated with autoimmune thyroid disease in Olmsted County, Minnesota. Trans Am Ophthalmol Soc. 1994;92:477-588. Burch HB, Wartofsky L. Graves’ophthalmopathy: current concepts regarding pathogenesis and management. Endocr Rev. 1993;14(6):747-793. doi: 10.1210/edrv-14-6-747. Liddle GW, Heyssel RM, McKenzie JM. Graves’ disease without hyperthyroidism. Am J Med. 1965;39(5):845-848. doi: 10.1016/0002-9343(65)90104-x. Perros P, Cromble AL, Kendall-Taylor P. Natural history of thyroid associated ophthalmopathy. Clin Endocrinol (Oxf). 1995;42(1):45-50. doi: 10.1111/j.1365-2265.1995.tb02597.x. Relimpio F. Subclinical hyperthyroidism. N Engl J Med. 2002;346(1):67-68. doi: 10.1056/NEJM200201033460116. Sieradzki I, Katra B, Mirkiewiez-Sieradzka B. Czynniki ryzyka wystapienia oftalmopatii w prsebiegy choroby Graves-Basedowa. Przegl Lek. 2000;57(6):321-323. Marcocci C, Bartalena L, Pinchera A. Ablative or non-ablative therapy for Graves’ hyperthyroidism in patients with ophthalmopathy? J Endocrinol Invest. 1998;21(7):468-471. doi: 10.1007/BF03347329. Mourits MP, Prummel MF, Wiersinga WM, Koornneef L. Clinical activity score as a guide in the management of patients with Graves’ ophthalmopathy. Clin Endocrinol. 1997;47(1):9-14. doi: 10.1046/j.1365-2265.1997.2331047.x. Gamblin GT, Harper DG, Galentine P, et al. Prevalence of increased intraocular pressure in Graves’ disease - evidence of frequent subclinical ophthalmopathy. N Engl J Med. 1983;308(8):420-424. doi: 10.1056/NEJM198302243080803. Gamblin GT, Galentine P, Chernow B, et al. Evidence of extraocular muscle restriction in autoimmune thyroid disease. J Clin Endocrinol Metab. 1985;61(1):167-171. doi: 10.1210/jcem-61-1-167. Nordmann J, Lobstein A, Gherarrd JP, Levy JP. Presentation of 14 cases of glaucoma due to elevated ocular venous pressure. Ophthalmologica. 1961;142:501-505. Vanni VF, Vozza R. Comportamento del tono oculare in vari tipidi esoftalmo. Boll Oculist. 1960;39:189-197. Dyer JA. The oculorotary muscles in Graves’ disease. Trans Am Ophthalmol Soc. 1976;74:425-456. Manor RS, Kurz O, Lewitus Z. Intraocular pressure in endocrinological patients with exophthalmos. Ophthalmologica. 1974;168(4):241-252. doi: 10.1159/000307046. Cheng H, Perkins ES. Thyroid disease and glaucoma. Br J Ophthalmol. 1967;51(8):547-553. doi: 10.1136/bjo.51.8.547. Cant JS, Wilson TM. The ocular and orbital circulations in dysthyroid ophthalmopathy. Trans Ophthalmol Soc U K. 1974;94(2):416-429. Copyright (c) 2018 Potemkin V.V., Goltsman E.V., Kovaleva M.S.